SQLScout 5.2.0 Released | IDEScout, Inc.
Tool tip in the “Execute SQL Statement” editor actions now displays the name of the data source to use to execute a Room query. 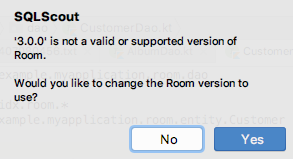 Fixed bug where the “Execute SQL Statement” editor actions did not recognize androidx.room annotations. Fixed bug where the “Execute SQL Statement” editor actions did not pick up the currently selected data source from the “SQLite Explorer” view. Updated default Room version to 2.0.0 in SQLScout’s settings page. “Room version” text field now provides a link to Room’s release notes. Migration wizard now detects whether the user-provided Room version is correct. Code generation now supports Room 1.x and 2.x versions. Fixed bug in Kotlin code generation where a generated class was not found.